I moved from Ottawa to Windsor last night. My precious Satchie got out of the Motel room we were staying at. She is a female DSH brown tabby. She’s spayed but not microchipped (what was I thinking?) and wasn’t wearing a collar. We spotted her under a porch in a house nearby but she got away and into an empty field. PLEASE IF YOU KNOW CAT RESCUERS IN WINDSOR, ONTARIO, PASS ALONG THIS MESSAGE. We need help retrieving her as she’s not coming to my call. 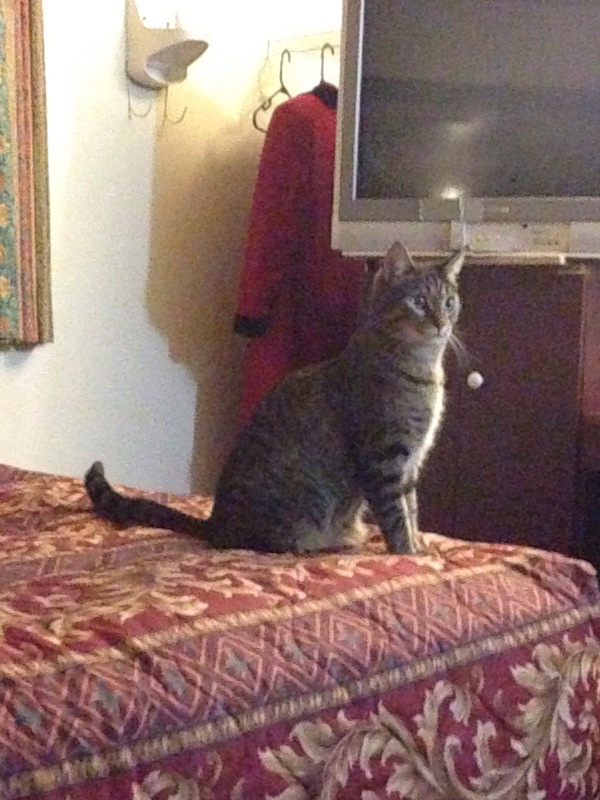 She escaped from the Royal Windsor Inn & Suites 2100 Huron Church Rd. Windsor, ON N9C 2L5. Presumably she’s still in the area. Email is the best way to contact me as I still have an Ottawa number and I’ll get charged long distance rates. OK, stop and don’t panic. Get a local rescue group on the case. They’ll need a cat trap and a tin of tuna (or her favourite treat, has to be smelly). Keep calling her name and shaking a treat box but make sure the trap is near where she disappered. Does Satchie have a favourite time of day to eat? If so, make sure her favourite food awaits her. Email me on annie.alexander@mac.com if there’s anything we can do to help. If you can give us more details on the area where she is lost, that will help us in our requests for assistance. The motel address is 2100 Huron Church Rd. Windsor, ON N9C 2L5. It is very close to the bridge to the USA and Huron Church Rd is the road that leads to it so the traffic is incredibly heavy and loud. My poor darling must be having a horrible time with all that noise. I don’t know what other details I can give you but I guess I could take some pictures of the area in the morning and post them here? Sorry to respond so late, not been that well. Thanks for the address – will try and see if we have any rescue contacts in the area but not too hopeful. Can you find anything out your end? In the meantime, make loads of missing posters with photos of Satchie, contact details, when and where she went missing and post them everywhere you can near the motel. Is Satchie microchipped? If so, contact the firm who runs the database and let them know she’s missing. I probably said this before, but I’ll reiterate–veterinarians’ offices can be incredibly helpful, from posting a picture of your kitty, to keeping an eye out in case somebody finds her and brings her in, to pointing you in the direction of any shelters in the area. I lost my doggie one day in my vet’s parking lot, I went in completely devastated…they sent out an APB, and I had her back within a few hours! Yes, I got posters printed today. It took some to the humane society and posted several in the area. Make sure to alert your former friends and neighbors in Ottawa. Cats have been known to travel hundreds of miles to return to what they know as “home” – even indoor cats. Yeah, when I was three years old, we moved to a different neighbourhood far away from where we were and my cat found me. Dunno know but she did. keep the faith. Satchie will return! Great that Animal Couriers is on the case, but be sure to alert the local Animal Rescue or “pound”. Also notify and post photos at every local vet’s office/animal hospital. Good thing you’ve got a photo! If you can print a “lost cat” poster and paper it everywhere in the vicinity, with handy pull-off contact info, that will help immensely. I see that lots of people have posted on FB. That’s great, lots of lost animals have been recovered that way. There are also animal rescue groups on FB and I’m sure you’ve already posted there. I have gone through this myself, and I know how horribly stressful it can be. Also post a notice in the local paper. Animal welfare groups comb these ads for clues to animals they have found. And Ruby’s right on–I have had an “escaped” cat show up at her previous home. She knew that motel wasn’t home! Silly humans. Praying for Satchie’s safe return!